I am the worst at waiting until last minute to do things. It is not my intention, but it always seems to happen. Well, this week is no different. In my defense, I was really working through ideas that led to the last minute scenario. So, this weeks BSI, hosted by one of my favorite bloggers, Nicole at Making Good Choices, is applesauce. Applesauce is a staple for me. If I am out of unsweetened applesauce, there will be an emergency trip to the store. I put it in things I make almost as much as I use oats - and that is a lot. In fact, applesauce is a component to my perfect morning oats! Anyway, off the subject...applesauce is the ingredient this week and my brain just started spinning. I wanted to try something a little different. I use applesauce in my baking often since I bake mostly vegan and I really feel like applesauce gives baked goods a little more moisture and some spring to the texture. After tons of back and forth, I finally decided on applesauce cobbler! I am not really a fan of apple cobbler because the apples tend to be rubbery. So, I chose to do a spiced swirl of applesauce in my gluten free, dairy free cobbler base! This completely hit the spot today! I served it with my vanilla coconut milk sorbet (made with So Delicious Vanilla Coconut Milk) and homemade caramel sauce! I kept all of the components on the less sweet side since I knew the caramel sauce would take it over the top. Indeed, it did! The cobbler reminded me of a huge cinnamon roll. 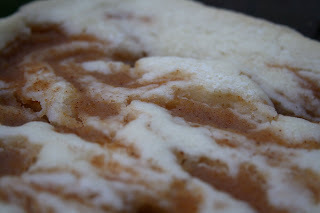 It was nice and cakey with a little bit of gooeyness. I think the best part about it though, was that Max helped me make all of it and he was so excited that we ALL could eat it together! Soak the white rice flour with the almond milk. (I did 4 ½ hours but I would imagine you could do this as long or as you like). Next add the sugar, 15 drops stevia, baking powder and salt. Pour the batter into an 8x8 pan that has been sprayed with cooking spray. 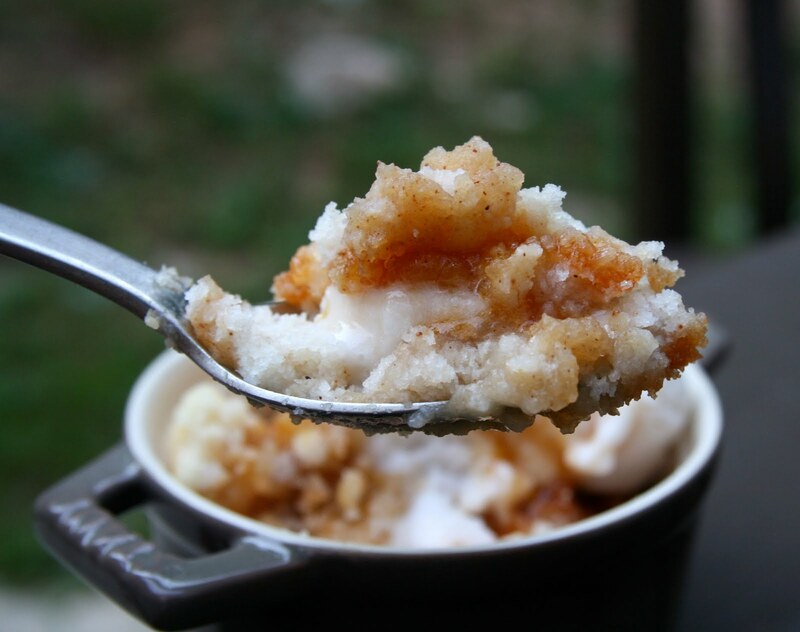 In a separate bowl, mix the applesauce, pumpkin/apple pie spice and 5 drops of stevia. Drop tablespoons of the apple mixture around the top of the batter. Swirl the applesauce mixture just a little bit. Bake for 40 minutes. 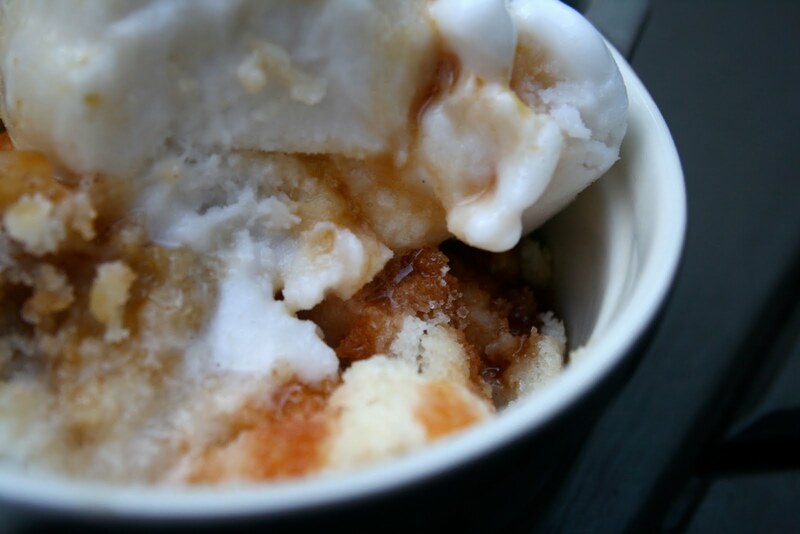 Serve warm with a scoop of your favorite frozen vanilla treat and caramel sauce. Mix 1/4 cup milk with the arrowroot powder and set aside. Combine 2 3/4 cup milk in a sauce pan with the sugar. Bring the mixture to a simmer. Turn it off and whisk in the arrowroot mixture. This will thicken as it cools a little. Then add the stevia and vanilla. Place in the fridge until cold. Freeze in an ice cream freezer according your machine's directions. What a creative recipe! I love it! Especially with the sorbet and caramel sauce! YUM! how smart to make a cobbler! would never have thought of it. oh yum! what a great dessert! I love cobblers and haven't had one in too many years to even count! This sounds fantastic. Yay Sarena!!!! 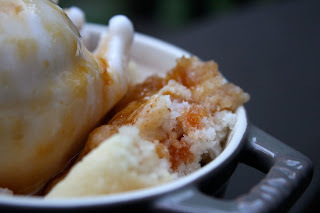 What a glorious recipe...both the applesauce cobbler and the Vanilla Sorbet :-) No time to cook this week, but will have to make this next weekend! I just discovered Grandma Hoerner's Applesauce at Costco and it comes in a 3 pack for $8. It is so delicious and super chunky :-) I always prefer chunky because I figure I can puree it to make it smooth. Let me know if you try it! That cobbler sounds delicious and nutritious, what a perfect combo!